When it comes to Lifehacking, Productivity, and Getting Things Done in business and in life, there is a constant stream of content pouring out from a seemingly endless number of gurus and experts out there. 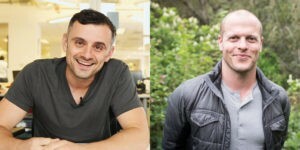 That said, the more familiar you become with these worlds, two start to really stand out: Tim Ferriss and Gary Vaynerchuk. Tim and Gary are two of the most successful self-made men in business and in life today, in no small part due to their willingness to share their thoughts, experiences, and learned expertise in entrepreneurship, personal development, and everything in between that has to do with achieving sustained success in business and in life. In this inbetweenisode, I try to reconcile the seeming differences between Tim Ferris’ approach to Gary Vaynerchuk’s approach to social media, business, and entrepreneurship and the important lessons you can learn and immediately put to use to get the right balance of hustle and focus. QUESTION(S) OF THE DAY: What’s YOUR approach when it comes to having the right balance of hustle and focus? Please let me know in the comments at the bottom of this post. Great podcast about finding your personal style, and being true to that. Also, thanks for making this streamable. Thank you Mari – appreciate the feedback. Glad you found this rant useful lol.